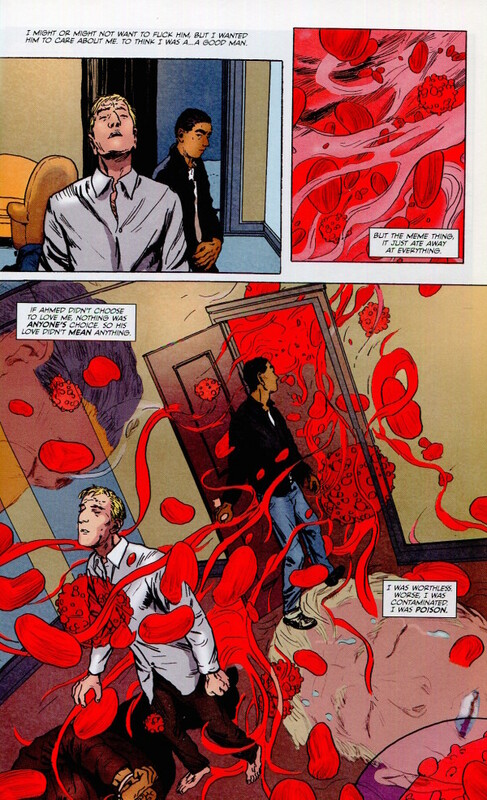 The PR line for Aaron and Ahmed, repeated in all its blurbs, is, “What causes terrorism?” It’s the starting point for the story written by Jay Cantor and drawn by James Romberger; the point-of-view character, Aaron Goodman, loses his wife in the terrorist attacks of 9/11. Aaron signs up to be an Army doctor and finds himself in Gitmo, working with another doctor who’s trying to find a root cause for terrorism no matter the cost. Aaron begins holding private interview sessions with Ahmed, one of the prisoners, lacing his food with estrogen to create a romantic bond which, as far as I can tell, is not a real thing (except for that one attempt with Hitler). It’s a pop psychology, sci-fi departure from the serious and realistic material, and as strange as it is, it’s nowhere near as opaquely dumb as what follows. Aaron’s superior decides that memes are behind terrorism—that the chanting of Muslim fanatics somehow infect the minds of terrorists with an idea virus that causes them to become suicide bombers. 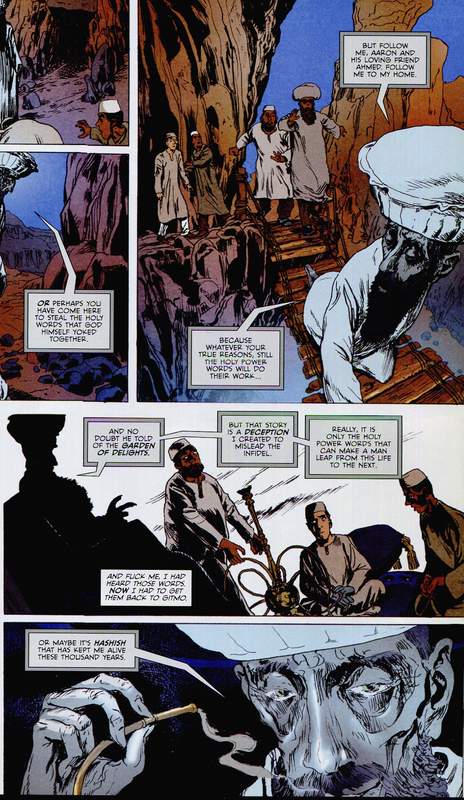 Aaron and Ahmed begin to trust each other, and Aaron decides that the only way to uncover the cause of terrorism is to travel with Ahmed to meet with a possibly mythical leader of Middle Eastern suicide bombers. Without spoiling the ending, what follows is maybe proof of Aaron’s meme theory or maybe a psychological play on his damaged psyche after witnessing his wife’s death and the horrors of Gitmo. However, the narration, provided mostly by Aaron’s internal monologue with occasional incursion by the Old Man of the Mountain, focuses entirely on Aaron’s belief that he’s being taken over by the meme virus of terrorism. It’s frankly obnoxious. Instead of exploring the real-life cultural, socioeconomic pressures exerted on the Middle East, Cantor’s script follows a white man’s sadness and his tragic struggle. It’s a version of Dances With Wolves, where the American soldier becomes an even better Muslim than his Muslim friend, being chosen over Ahmed to become a suicide bomber. The real-life catalysts of terrorism—oil wars, installed dictators, Cold War tensions—are mentioned throughout, but it feels like lip service in the onslaught of meme talk. And it’s a strange thing, because another important aspect of the book is the power of words. Chants and prayers, in Cantor’s meme philosophy, are rhythmic deluges of words that infect those that hear them, turning them into suicide bombers. So using the meme narrative—using all the words in the comic to describe the sci-fi theory—in lieu of the more realistic possibilities is an odd choice. Is Cantor saying that only fantastical words can infect people with large ideas? That his meme ideas are akin to the prayers, and he’s hoping to infect us with his story? Once a potential suicide bomber is infected by the chants of the Old Man of the Mountain, it takes an image to activate their programming. This is perhaps the most interesting part of the book since we’re dealing with a comic—a story that puts the lie to any kind of false dichotomy between image and picture. 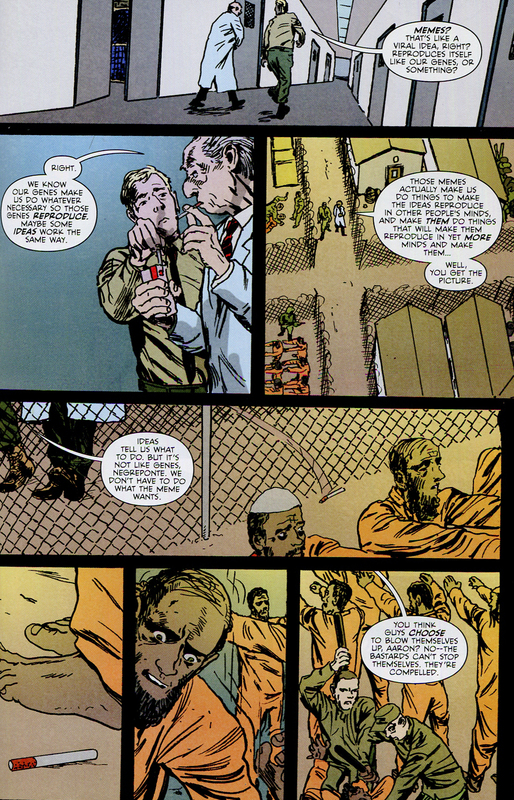 Both Aaron and an unnamed prisoner talk about being activated by images, but a comic book also plays a big part in the plot. In possession of a jailer, it inspires soldiers to demean and abuse a prisoner. It’s taken away by one of the soldiers, though, and she scolds the others. Later on, she commits suicide with a grenade, effectively becoming a suicide bomber in the process, and her possession of the comic is repeatedly highlighted. A word on Aaron and Ahmed‘s images: they are the best part of the book. 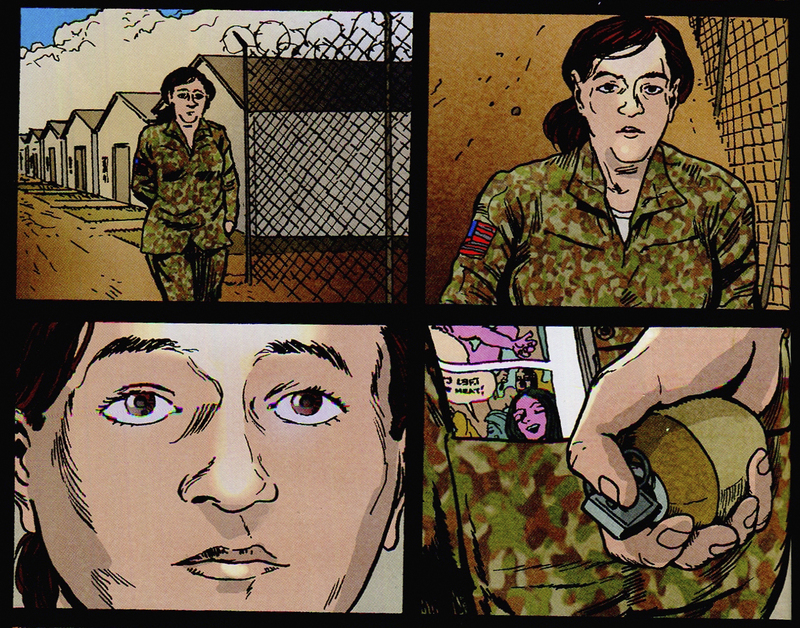 Romberger has been a great cartoonist for years, at least since his work on 7 Miles a Second (an intensely personal and apocalyptic book that faces contemporary issues in a way that puts Cantor’s script to shame). It’s Romberger’s art that makes the characters of Aaron and Ahmed actually feel like people; his soft, at times almost squishy anatomy balances out Cantor’s cold and clinical script. Especially amazing are Romberger’s portrayals of the more fantastical scenes. Where Cantor’s script hammers at the sci-fi elements, Romberger’s drawings, such as of the Old Man of the Mountain and Aaron’s impending infection, are have a softer, subjective feel to them. They’re much more subtle than Cantor’s script, even at their most tortured and lurid. They’re helped, of course, by the balanced colors by José Villarrubia. Cantor’s obsession with the interplay between words and images rings false in light of this book. It would have been much better as a wordless comic.